Summertime and music just go together perfectly. And when the venue is the Village Green in the center of Pentwater, the evening is simply charming. While music fills the air throughout this quaint harbor town, people of all ages gather around for old-fashioned fun. Every Thursday night during the summer, generations of families come together for an idyllic Pentwater evening. It's an event not to be missed. 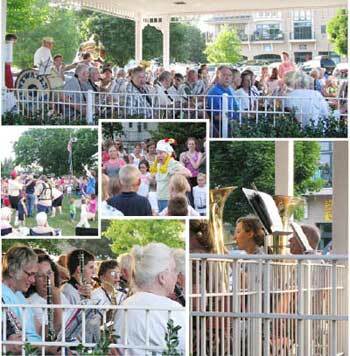 Enjoy the nostalgia of the community band playing music under the gazebo, watch the children dancing, and go ahead and laugh when some of the audience joins the kids for the chicken dance! 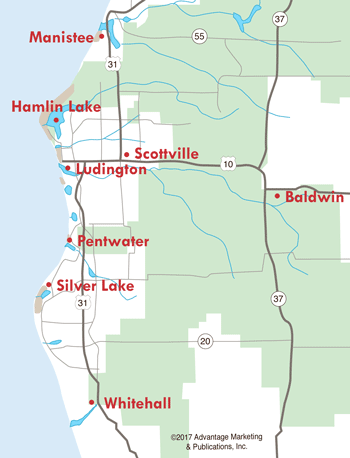 The Pentwater Civic Band is comprised of local residents and visitors who play together for the love of music. You'll see musicians of all ages--from students to old-timers. Many members of the Scottville Clown Band join in on a regular basis, though not in costume for this occasion. 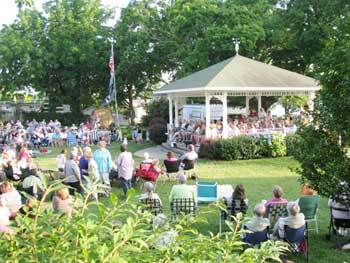 These Civic Band Concerts at the Village Green have been a tradition in Pentwater for over 60 years--and for good reason! The cheery music along with the lovely setting makes for a wholesome, enjoyable, FREE evening. There's no charge to linger and listen. At least once this summer, bring your lawn chairs, lay down blankets to sit on, or grab a seat on a picnic table in the Village Green. Then sit back, relax and enjoy show tunes, marches, patriotic selections and old-time favorites. If your family includes a four-legged member, you'll be glad to know that well-behaved pets are welcome on the Pentwater Village Green. Just please be considerate and clean up after them. It's amazing how well dogs seem to appreciate the fresh air and extra attention children are happy to give them. Community Musicians Welcome to Play! The concerts run from 8-9pm every Thursday evening in the summer. If you can read music and would like to bring your instrument and play along, please arrive a few minutes early to receive your copies of the night's musical selections. For more information, go to: Pentwater Civic Band.